Doceri - A Free Screen Recording App That Saves to the Camera Roll! Doceri is a free app much like ShowMe, Educreations or Screen Chomp that lets you create a video recording of drawings with narration. The feature that Doceri has that the others don't is that Doceri lets you save the recording directly to the camera roll. Once it's on the camera roll you can easily add it to Keynote or iMovie projects or email it. Plus there's no login required! 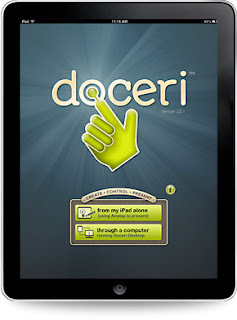 Check out this tutorial for recording and sharing a Doceri screencast. Doceri also has a Pinterest board with several other tutorials and ideas for using it in the classroom. 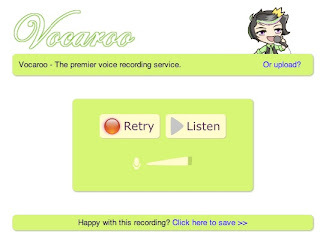 Vocaroo is a super easy way to record and share audio files. Since the recording feature is flash based, you can only record via a web browser on any computer with a microphone. You can't record on an iPad. However, playback of the audio files will work on the web and on iDevices like iPads, iPods or iPhones. To record a file, simply click the "Click to Record" button. (Click "Allow" on the message that pops up.) Once you've recorded, click "Listen" to preview your recording. You can click "Retry" to start over. If you like your recording, click the "Click here to save" link. You will be presented with several sharing options. You can email, embed into a blog or webpage, download as an MP3, etc. My favorite is the QR code link to automatically generate a QR Code straight to the audio file! This would be great for an Open House project. Parents can scan the code to listen and use the link to download the MP3 file to their computer when they get home. There is no set time frame for audio recordings to be stored on the site and no limit to how long messages can be. For more information see the "Help" link at the bottom of the page for FAQs. What ideas do you have for using Vocaroo in your classroom? Post a comment below to share your thoughts!